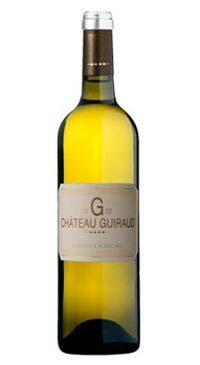 Known and loved for its Premier Grand Cru Sauternes, the Bordeaux estate, Chateau Guiraud, displays another side of the vineyards potential with their dry white wine. Made from Sauvignon Blanc (70%) and Semillon (30%) from vines aged 15 years on average. Fruity and floral, it reveals a lively mouth and flavours of acacia and white fruits. The wine is fermented in oak barrels with regular lees stirring for 3-4 months followed by a 9 month period of ageing in old Sauternes barrels. The oak is seamlessly integrated and does in on way distract from the wine’s freshness or fruit. The wine has a lovely balance of bright acidity with a creamy mouthfilling richness. Peach, melon and salted butter notes. The stylish finish hints at macadamia nut.